Ferrero’s world wide well known brand continued its Buggy concept this year, for which ARworks ME – with Grey MENA – developed Buggy Race, this unique, spectacular probably the most advanced Augmented Reality application in the world. 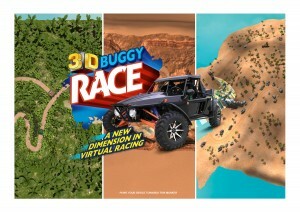 The app is a car race, with 3 different courses – The Bueno Desert Canyon on, The Wild Jungle and ThePirate Bay. Users, as they play, can upgrade/tune their cars in the Garage with various items so it goes faster and looks better. There are 2 views of the race – the classical Augmented Reality one, where the racecourse appears on an the package of an actual Kinder Bueno chocolate bar – that also means, that moving far away enough the whole race course can be viewed. In the other one no AR is used, just a classical car race rear camera view. The AR race app is not just a catchy game, but it served as the database for a prize drawing mechanism. Forget about hostesses, leaflets, or sms promotions – use only one application where users are registering with their own facebook account. The customers downloaded the app, played with the Kinder Bueno chocolate bar, finetuned their race cars, uploaded their results, competed against each other, and shared their results or pictures on social media. For this we not only developed the app itself, but a fully functional microsite with the actual results, facebook tab, and promo video too.